Standards and industry go hand in hand. You can’t have one without the other. Because pipe is so common among so many industries, it’s no surprise that a number of different standards organizations impact the production and testing of pipe for use across a wide array of applications. As you’ll see, there’s both some overlap as well as some differences among the standards organizations that buyers should understand so that they can ensure accurate specs for their projets. 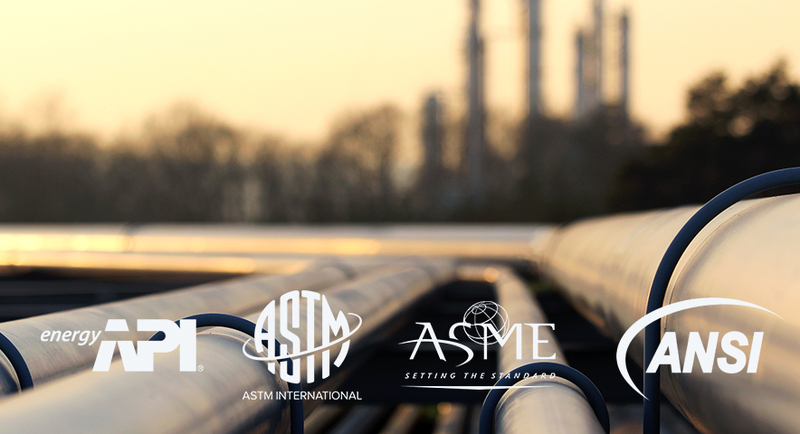 ASTM International provides industrial material and service standards across a wide range of industrial sectors. The organization has published more than 12,000 standards currently in use in industries worldwide. More than 100 of those standards pertain to steel pipe, tubing, fittings and flanges. Unlike some standards organizations that impact steel pipe in specific industrial sectors, ASTM standards cover a wide variety of pipe used in just about every industry you can think of. For example, American Piping Products stocks a full range of A106 pipe. The A106 standard covers seamless carbon steel pipe for high-temperature service. That standard does not necessarily limit pipe to any certain industrial application. The American Society of Mechanical Engineers began publishing standards for industrial tools and machine parts in 1880 and has been a driving force behind safety improvements to boilers and pressure vessels used across industrial sectors. As pipe commonly accompanies pressure vessels, ASME standards cover a wide variety of pipe applications across many industries, same as ASTM. In fact, the ASME and ASTM pipe standards are largely identical. Any time you see a pipe standard expressed with both an ‘A’ and an ‘SA’—an example is A/SA 333—it’s a sign that the material meets both the ASTM and ASME standards. As its name indicates, the American Petroleum Institute is an industry-specific organization that, among other things, develops and publishes standards for pipe and other materials used in the oil & gas industry. Piping rated under an API standard can be very similar in material and design to pipes used in other industries under other standards. API standards are more strict and include additional testing requirements, but there is some overlap. API 5L pipe, for example, is commonly used in oil & gas settings. The standard is similar to A/SA 106 and A/SA 53. Some grades of API 5L pipe comply with the A/SA 106 and A/SA 53 standards and therefore can be used interchangeably. But A/SA 106 and A/SA 53 pipe do not comply with all API 5L criteria. The American National Standards Institute was founded following a gathering of several industry standards organizations in 1916 with the goal of developing voluntary consensus standards in the U.S.
ANSI joined with similar organizations in other countries to form the International Organization for Standardization (ISO). The Organization publishes standards accepted by industrial stakeholders from across the world. ANSI also acts as an accrediting body that endorses standards developed by individual organizations for worldwide adoption. Many ASTM, ASME and other standards have been endorsed by ANSI as acceptable common standards. One example is the ASME B16 standard for flanges, valves, fittings and gaskets. The standard was initially developed by ASME, but it’s been endorsed for use worldwide by ANSI. ANSI’s efforts have helped open international markets for producers and suppliers of pipe due to its role in the development and adoption of common standards accepted globally. With decades of experience supplying pipe to customers of all industries all over the world, American Piping Products understands the complexity —and the importance— of the many standards that govern the production and testing of pipe. Let us use that experience for the good of your business. By choosing American Piping Products as your supplier, you can focus on what matters most to you instead of getting bogged down in the details. We’ll handle that. To see what we’ve got in stock, view our product catalog. You can also get more in-depth information to aid in your buying process by downloading our steel pipe buyer’s guide.